If your thinking about feeding backyard birds? You need know that they need more than just seed, they also need fat products like suet blocks. This page features some great feeders to hold suet blocks. If you are looking for a great gift idea for bird lovers or for garden lovers, one of these could be just the thing. 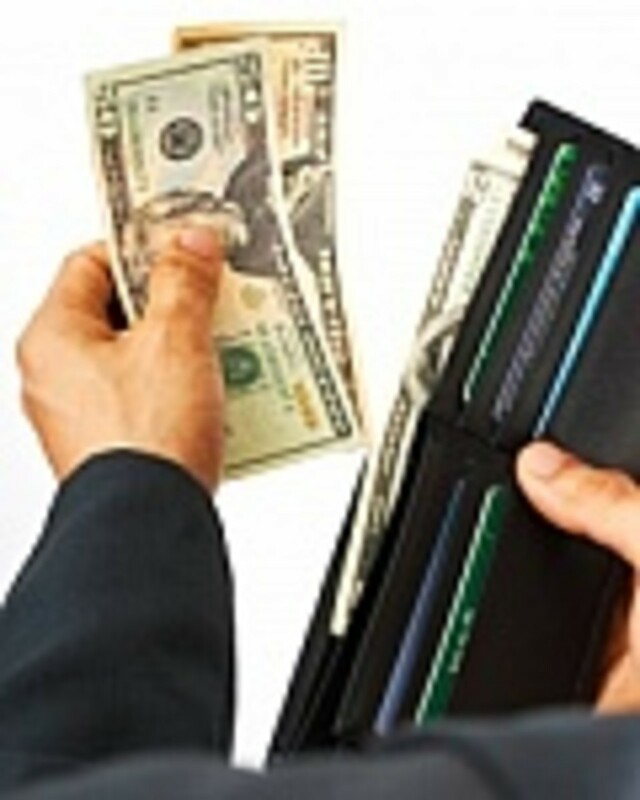 Scroll through to enjoy a variety of styles and shop in a range of price ranges. 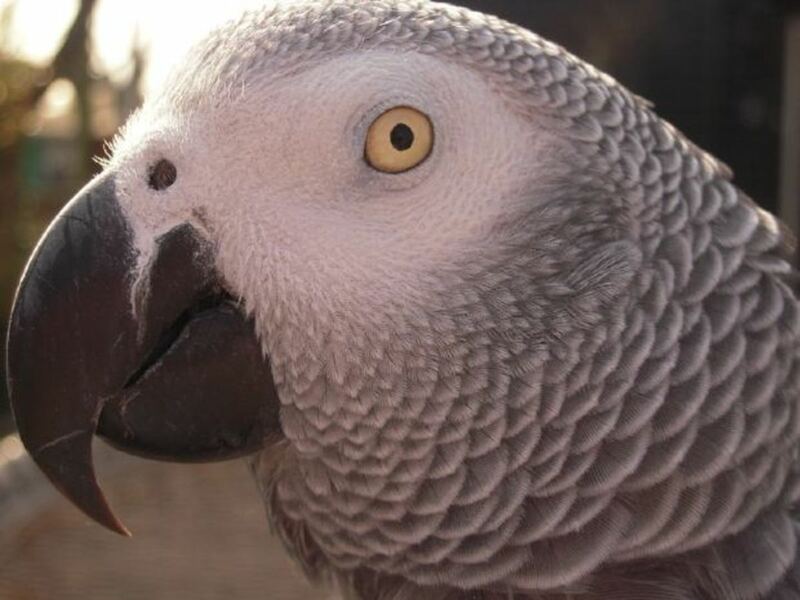 There is also some interesting information on feeding backyard birds for you to enjoy. Colorful bird feeders that hold 2 suet blocks in cages. Easy to fill, easy to clean. Choose from yellow, black or red. This is a nice quality constructed all weather resistant feeder. The nice little roof assists in keeping the feed dry and there is a descent size of perch that attracts various species of birds! There is not a lot of reviews for this feeder and I have not actually come across it during my travels, one good thing going for it is that it's made out of recycled material and the price is not all that bad! I like this nice and simple feeder, it's made in the USA from partial recycled plastic, it has the capability to hold up to 5 lbs of mixed seeds and 2 suet cakes. Nice and easy to maintain. This is a great combination of hopper feeder and suet feeder. This feeder is easy to keep filled and keep clean. There is a few good five star reviews, and most buyers appear to be pleased with the product, attracts lot of various birds and it comes in at a reasonable price. This is a really nice gift idea for any bird lover. 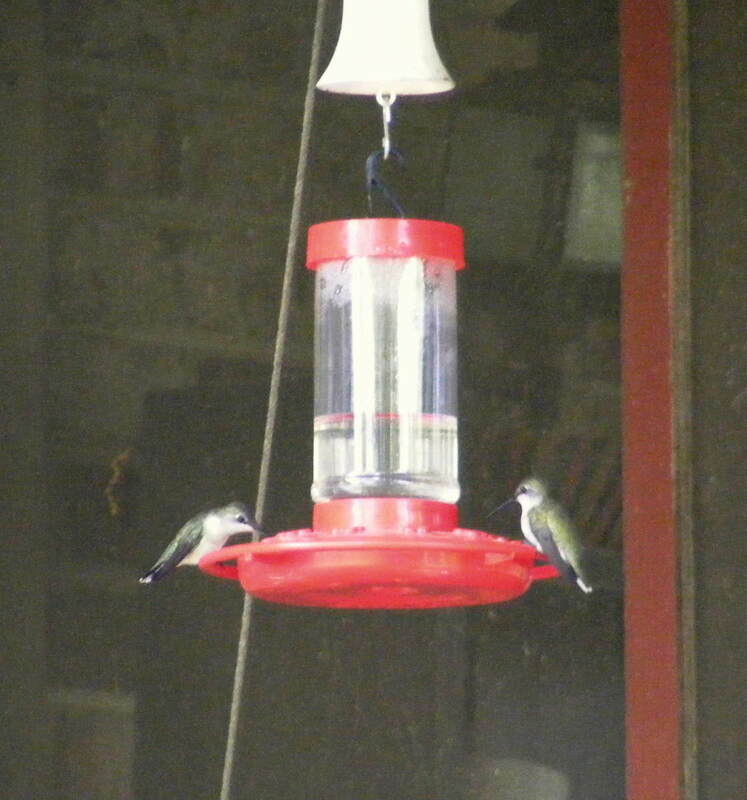 A nice simple inexpensive feeder that is a good place to start if you are just venturing out into the world of backyard birding. It will hold up to around 4-pound of seed and two suet cakes, There is a large roof that will help keep the seed nice and dry and to enable easy replenishment and cleaning. It's not a bad little feeder and the price is fairly reasonable, although I would not personally purchase this model, maybe this is a good one for the kids who are interested in backyard birds? 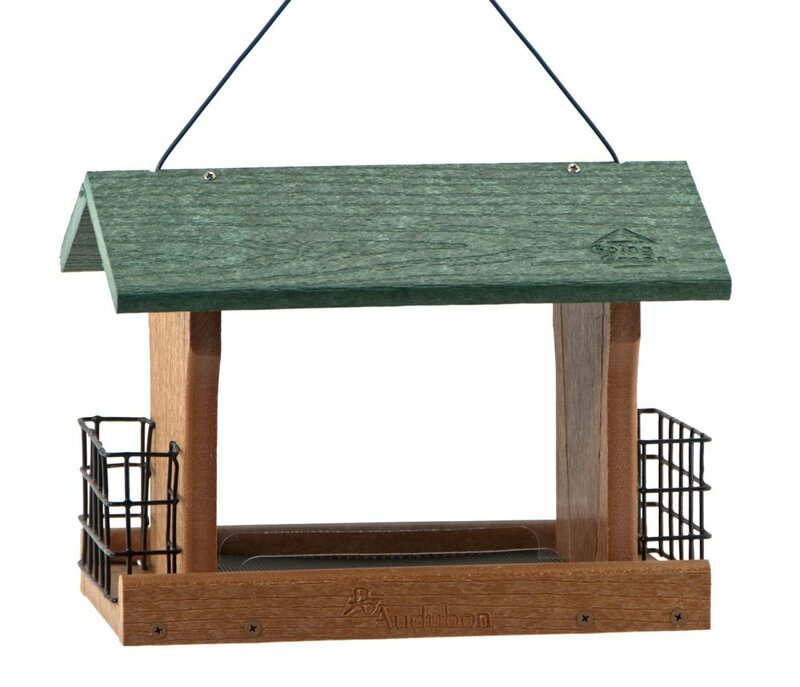 This is a nice little wooden feeder, made in the US and will look nice in anyone's backyard. Made from reforested, kiln dried, inland red cedar wood, with a polycarbonate windows and roof which is hinged nicely that allows easy replenishment and cleaning. it can hold up to 5 pounds of seed and 2 suet cakes, and comes with a nice cable for easy hanging. A few mixed reviews between the four and five star recommendations so worth while checking out just in case you have any concerns if considering a purchase. It's a pretty reasonable price, should look good in any backyard or balcony and would certainly be a nice gift for any bird lover! 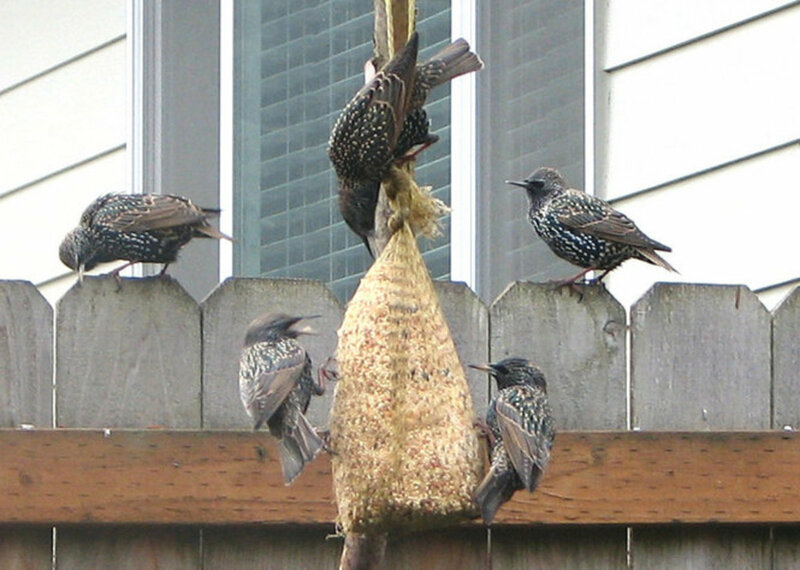 Why do Birds need Suet? Suet is fat - mostly rendered animal fat but sometimes vegetable fat. And fat for birds equals energy. 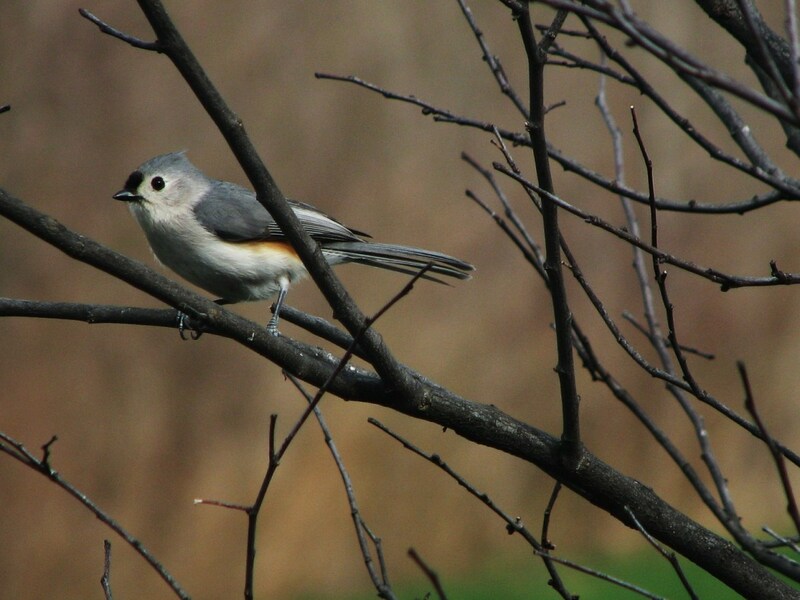 Birds, especially small backyard birds use up tremendous amounts of energy searching for food so if you can supply them with an easy food source they will thrive. Suet supplies much more protein than insects and birds benefit from it all year round. 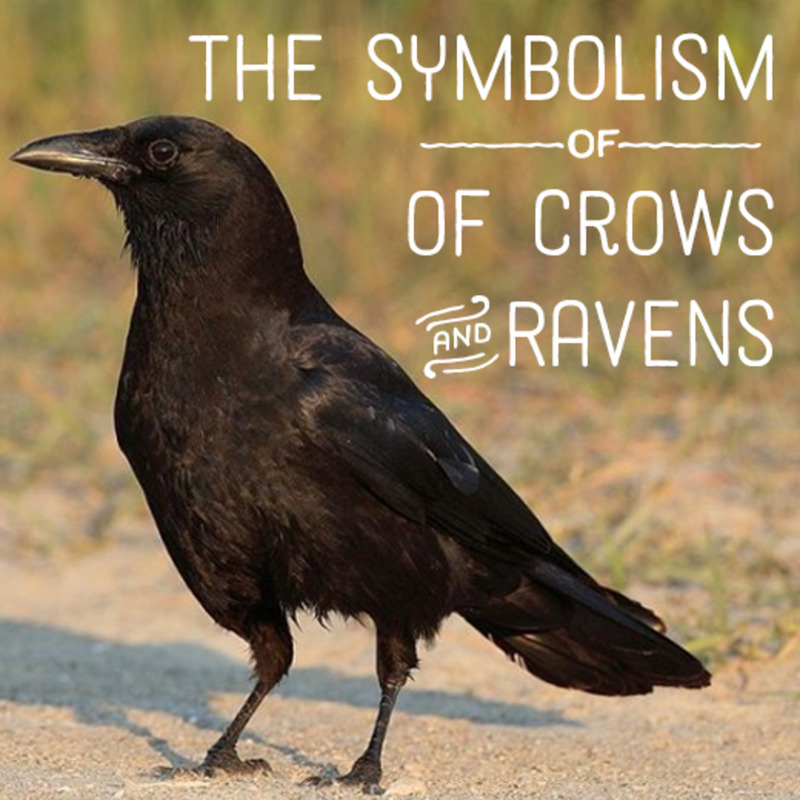 In winter it helps them survive both from a food point of view and in providing heat. 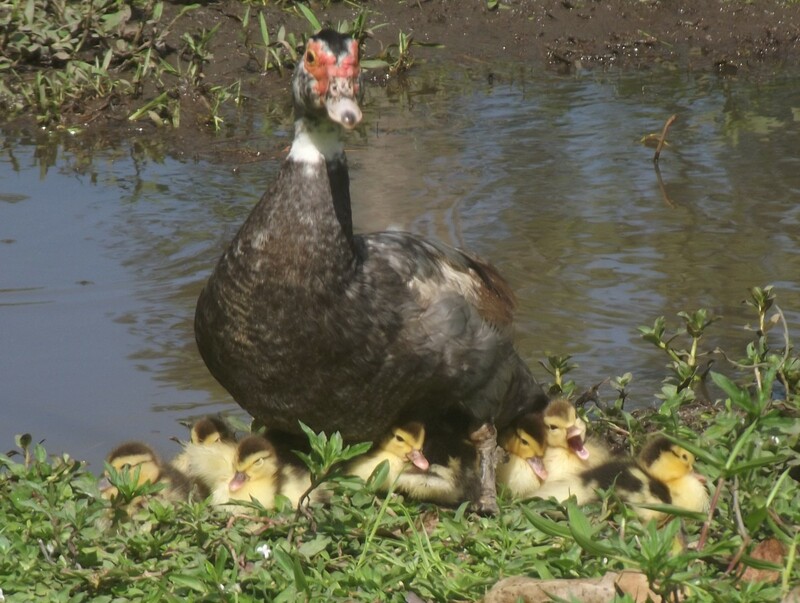 In spring it provided them with renewed energy for nest building, mating and egg laying and in summer gives an easy-access source of food when they are feeding their young. Autumn, is of course a time for building themselves up ready to face winter. Using suet cakes in cages like these is a really easy way to provide for their needs. So we have highlighted Amazon's best seller above and thought it would be good to showcase another Suet Cake...I have not personally made a purchase of this product but at the reasonable price it is selling for I guess I shall try it out one day. This is another all season suet cake, easy to open, can be a little messy when in the feeder, there again depends on what feeder you are using, but the birds are said to love this, some nice reviews shared with this twelve case of food. I'm actually thinking of buying a backyard bird feeder package for some friends this Christmas, a nice little bird feeder and the suet cakes to go with it! What more could an avid bird watcher ask for.. This is Amazons Best Seller of premium wild bird food, we have spoiled them with suet blocks and there is nothing better than a little variety, so why not add some of this food! With over one hundred five star positive customers reviews and coming in at a very reasonable price of $19.98, this is not something that should be sniffed at. The birds love it, the customers love it and Amazon loves it, how much more need you be convinced? An great mixture of seeds and peanuts, why not throw this in with a backyard package gift for that bird lover! Many of the birds who love suet are clinging birds that usually forage on trees - so clinging to a cage is easy for them. Place a cage in a shady spot high off the ground for them,. But ground feeders also need fat so you can crumble some suet in along with seeds for them or just leave a suet/fat ball (minus any net bag) on the ground for them. 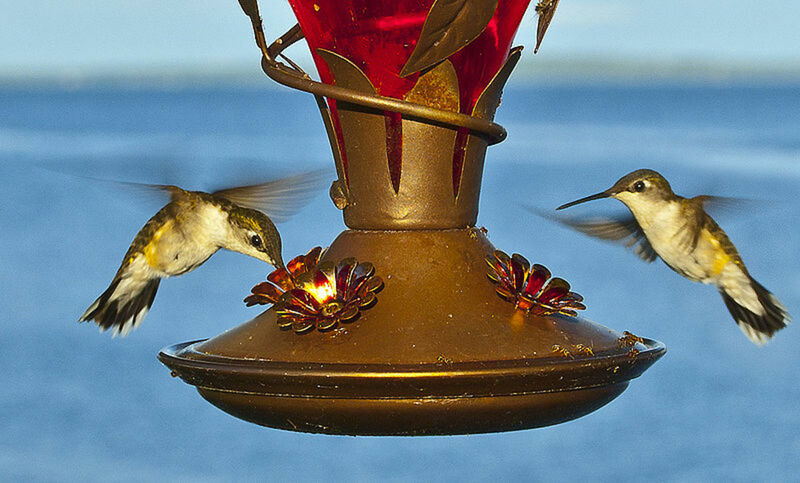 These feeders solve the problem of space if you have a small garden, patio or balcony. No matter how little space you have there is always room to feed some of the birds using these types of feeders. 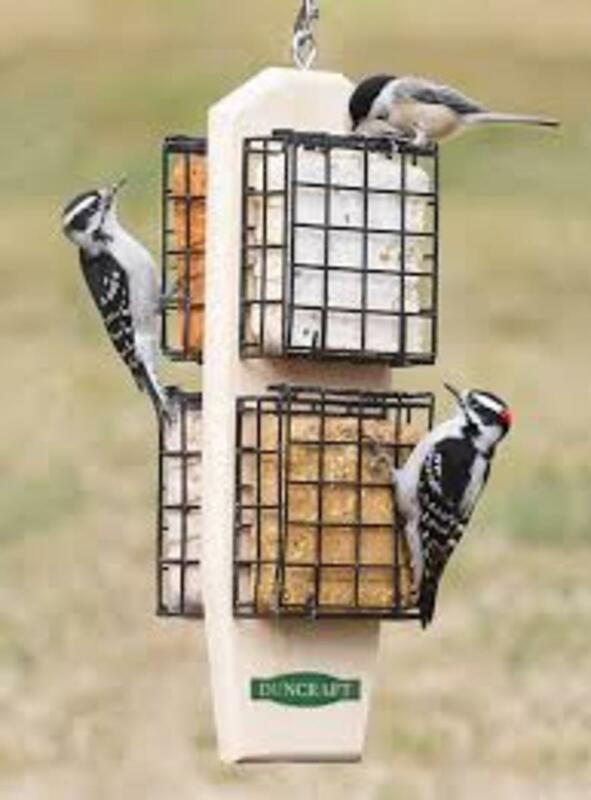 Fill the sides of the feeder with suet cakes for those birds that can cling to the cages and provide suet pellets or crumble some suet in along with the seeds in the seed feeder for the others, enjoy the variety of birds that visit your backyard! Protects the suet feed from squirrels and large birds, holds two suet blocks and has over one hundred five star positive reviews from customers, nice and simple feeder with a simple price tag. Check out the review video from a very pleased customer, says it all! Simple, basic, single suet cake feeder that will do just fine if funds are a little low. It's made of Cedar wood and held together by stainless steel screws, comes with a cable for hanging and the vinyl coated mesh secures the cake. Made in the USA and great as a started project. Questions & Answers that may help? A. Suet comes from the hard fat which is located around the kidneys and loins of beef and mutton, woodpeckers, chickadees, jays, and starlings, wrens, creepers, and even cardinals but to name a few, are very attracted to suet feeders as it is a high-energy food, especially valuable in cold weather. Q. Which seeds are the most popular ones to use for backyard birds? A. with what experience I have and in-depth investigation it would appear that Black Oil Sunflower Seed are the ones most popular! smaller than regular sunflower seed and meets the needs of the smaller guy. Most birds will eat these seeds. Q. What's the best tips on cleaning my feeder? A. Naturally you need to remove any old feed, then; Soak and thoroughly wash the feeder in hot soapy or light bleached water,making sure you scrub it well, then: Allow the feeder to dry, watch if you leave on open decks as birds may try feed from it. A whopping seven hundred plus positive five star reviews and over one hundred and fifty four star reviews, this is one of Amazon customers favorite food storage container, now how can you go wrong with all that feedback. The food needs be kept dry, away from other prying eyes and free from any other contamination, these containers will do the job for you! You have a combo kit here so apart from housing the backyard food, there is a larger section for the dog or cat food. I am just surprised at the actual price coming in at $27.99, if I up-size my feeders, I will probably do the same for the container and this will be the guy I would pick! Amazon's No1 Best Selling Backyard Birds Book! The positive reviews and description of content say's it all! Some nice research and reading! If you wish to go more into depth about various feeders for your backyard birds then this book is probably worth consideration, some pretty nice reviews by customers! Easy Suet Recipe by Birds & Blooms! Shared with love by Birds & Blooms, these simple yet effective recipes are loved by many, especially the birds! The Birds & Blooms link is below, please feel free to take a peak! 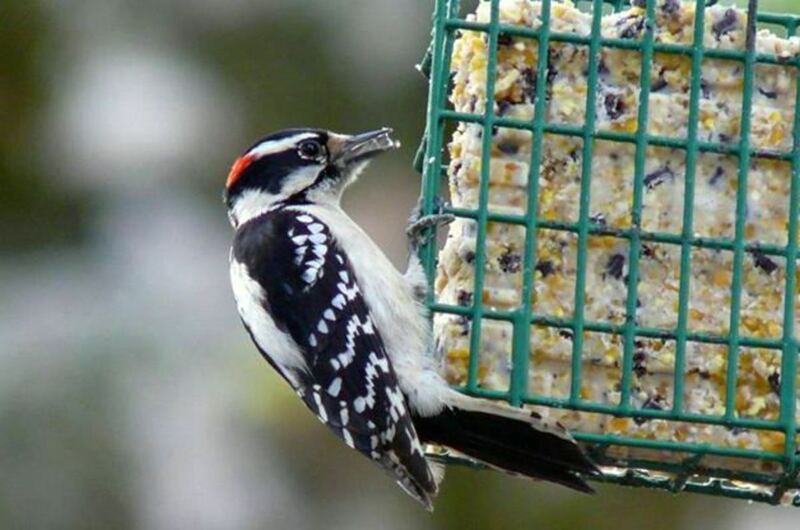 Which suet feeder will you buy? I keep a suet feeder on our bird feeding station, but usually just fill it in the colder months. I might try making my own suet cakes this fall. I love these. Working from home is nice but looking out the window and seeing robins, blackbirds and more feeding is magical! One day I'll get into these backyard birding suet feeders...people I know who do this are very passionate about bird watching.